Welcome to another Sunday edition of Stuff I Like, a little browse through the items I have that I find interesting, so into my collection they go. While I have a TON of cards that I enjoy, today, we will pull something off the wall of my computer room to showcase. I like quirky. I like unique and different. And I like eBay (at times). Every so often a nice collection of vintage AP (that's Associated Press) images will hit the auction site. And these are not reprints. These are the actual photos that were taken and offered over the wire for newspapers to print in whatever edition was on the presses. 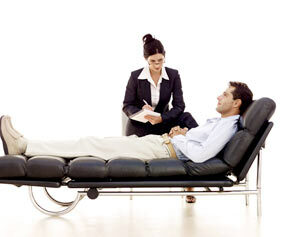 Some can go for a high amount, but you can find deals if you look around enough. A couple years back, a large collection hit and I picked out a few to bid on. Most went well out of my range, but one stayed pretty cheap. A few pictures, however, had zero bids. Since you get a nice bundled shipping price, I bid on another photo and snagged it. I pulled two AP wire photos for under $10 with shipping. Maybe a lot to some people, but pretty cool if you ask me. It's later when this revelation came to me: I have three B&W AP wire photo baseball pictures on my wall, and two of them are pictures of players being injured. 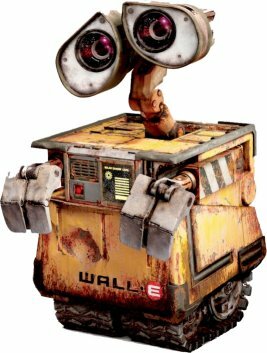 What's that mean about me? How long have you hated your mother? As baseball pics go, I think this is awesome. And with the recent passing of Moose Skowron, now's a good time as any to enjoy a photo 56 years old of the man in action - so to speak. Click on the image to get the full effect - I left the scan quality high. 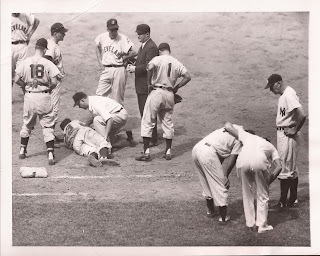 You have Moose on the lower right, attended to by the Yankee trainer while Cleveland first baseman Vic Wertz is checked out by their respective trainer following a collision at first base. You can read more about this collision from this Google archive of the Florida Sunday News Journal. The great part about this photo is the attached write up in on the back. You can view it here, and underneath the write up you can view the Associated Press's copyright information here. Moose, being Moose, knocked Wertz out of the game. Look close and to the right of the catcher (#18 - Hal Naragon) you see future HOF Bob Lemon. 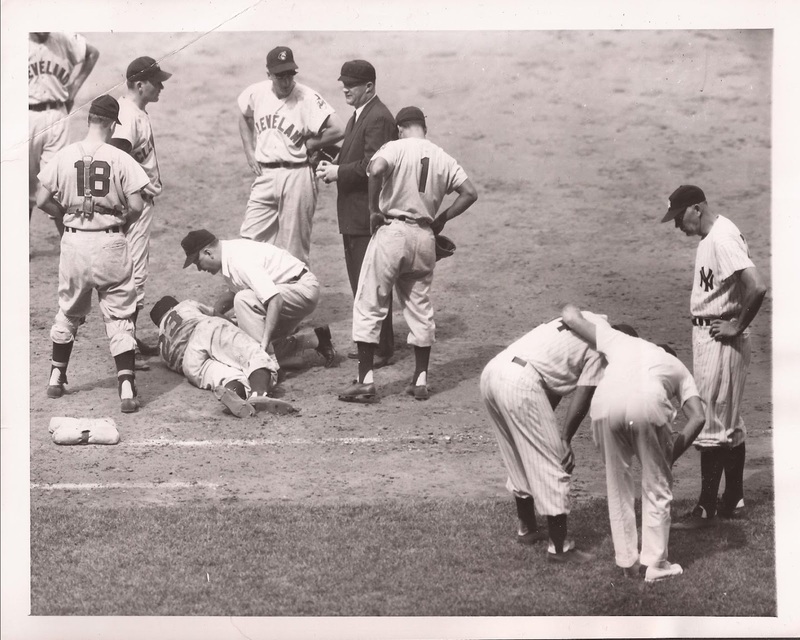 And to the far right, seeing how Moose is holding up, is HOF catcher/manager Bill Dickey. And if the name Vic Wertz sort of rings a bell, he was the man that hit the ball you see in this famous play. And they are all on my wall.